nAm manni vAzha * nenjE! solluvOm avan nAmangaLE. 1.
maNavALA mAmunigaL’s vyAkyAnam is short and has provided word by word meanings for the pAsurams. 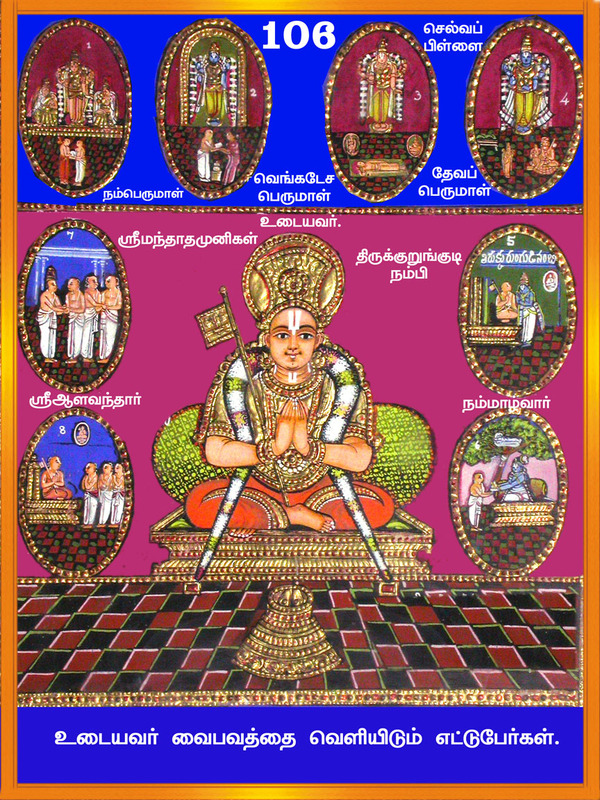 piLLai lOkam jIyar has provided detailed vyAkyAnam. amudhanAr is talking to his heart that we shall say the divine names of emperumAnAr such that we live permanently under the divine feet of emperumAnAr. thAm manna – the pundits themselves came and surrendered to emperumAnAr. nAm manna – we who had been under the feet of other insignificant matters all those countless lives, shall surrender to him. So none of these four were giving company to amudhanAr, and so he is calling his mind which is always commonly available during good and bad times, to give him company. pU mannu mAdhu – pU -> lotus; pU mannu -> padhmE sthithAm -> pirAtti well set in the lotus flower. (This is in the last part of pAcha rAthram, lakshmi thanthram where periya pirAttiyAr talks to indhran about her vaibhavam – that is srI suktham). malar mEl mangai – also means the same. It was as if the fragrance and beauty of the lotus flower was in the form of periya pirAttiAr. It was as if the definition of pirAtti was to be on the lotus flower. 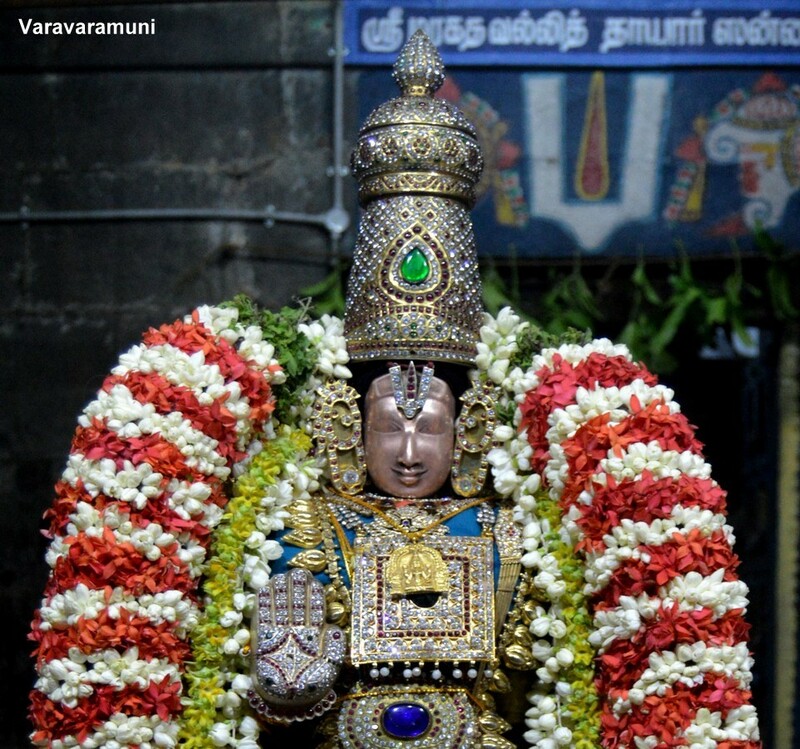 sarvEshwaran who has got such a divine chest – mArban. mArban-> mAdhu (pirAtti) is nirUpaka dharam (one who is the identifier) for emperumAn. visEshya bhUthan -> based on mAdhu porundhiya mArbu (he is being identified based on pirAtti). Similarly, ennuL kalandhAn [thiruvAimozhi 2-5-2] is a name for emperumAn as given by AzhwAr – emperumAn getting immersed in AzhwAr is the identifying factor of emperumAn! shradhdhaya dhEva: dhEvathvam ashnuthE- because of periya pirAtti, dhEvan gets referred to by the name of dhEvan. In srI rAmAyaNam, mArIchan says ‘apramyEam hi thaththEjA’ => his valor is beyond the comprehension of mind. 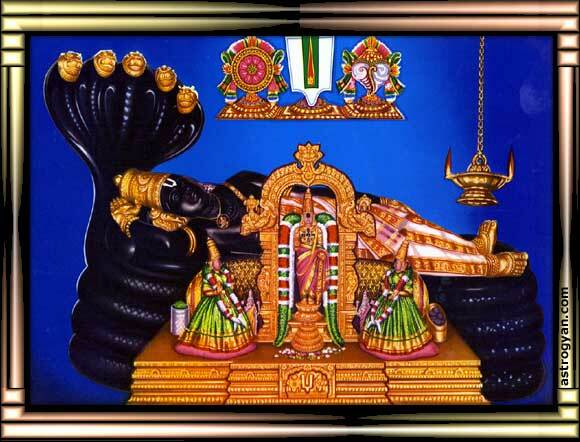 Whose valor?, He says ‘yasyasA janakAthmaja’ – the one who is the husband of sItha. ‘pithus satha guNam mAthA’ – a mother possesses 100 times more qualities than a father; gowravENa athirichyathE – such is the greatness of the mother by her own qualities. Similarly, because of pirAttiyAr, emperumAn gets his greatness. (mArban) pugazh malindha pA – pA: poetry/pAsurams. The auspicious qualities and greatness of emperumAn are spread (malindha) throughout the pAsurams (of nammAzhwAr). 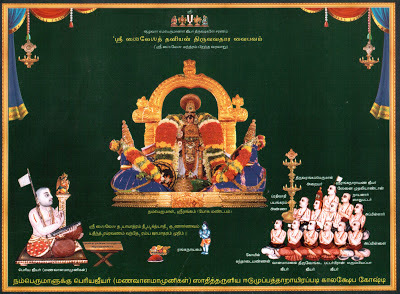 Following are from the beginning, middle, and end of thiruvAimozhi of nammAzhwAr where the qualities of emperumAn are described. uyarvara uyar nalam [thiruvAimozhi 1-1-1] -> against adhvaitham -> guNa visishta brahmam is parAthpara thathavam (brahmam with qualities/characteristics is the truth about creator of all). 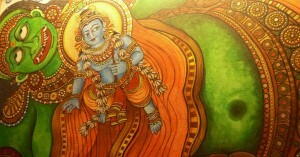 udal misai uyir enak karandhengum parandhuLan [thiruvAimozhi 1-1-7]-> vyApthi -> He is there everywhere. emperumAnAr uses the deep meanings of this pAsuram as the guiding lamp in his srI bAshyam -> as azhagiya maNavALap perumAL nAyanAr also said in AchArya hrudhayam: idhu koNdu sUthra vAkyangaLai orunga viduvar; as emperumAnAr at the end of his arguments says, so this is thus explained/related/solved; ithi samanchasam). For paramAthmA – by its nature it is spread everywhere. It is not like just the pillar touching the roof. But spread into everything. neer thoRum parandhuLan -… aNdam idhena [thiruvAimozhi 1-1-10] -> emperumAn is vyApakam (pervaded) including inside the pillar, roof, etc. And even in small places like a water drop, he is comfortably set, similar to being comfortable in space. It is not just vyApakam, but he is also controlling everything – niyanthruthvam. AkAsam (space) is having vyApthi -> but no niyamana sAmarthyam (ability to control). A king does not have vyApthi – he can be in only one place a time -> but he posses niyamana sAmarthyam – just a waving of his hand can change things in his kingdom. It is emperumAn who has got both the abilities. onrum thEvum … [thiruvAimozhi 4-10] => kAraNathvam – he is the cause/creator of everything. nOlAdhu ARREn una pAdham [thiruvAimozhi 6-10-8] -> sarva easwra easwaran. – He is the controller of all the controllers. pAzh => prakruthi => non-sentient. Thus nammAzhwAr describes ten auspicious qualities of emperumAn in thiruvAimozhi throughout (beginning, middle, and end). 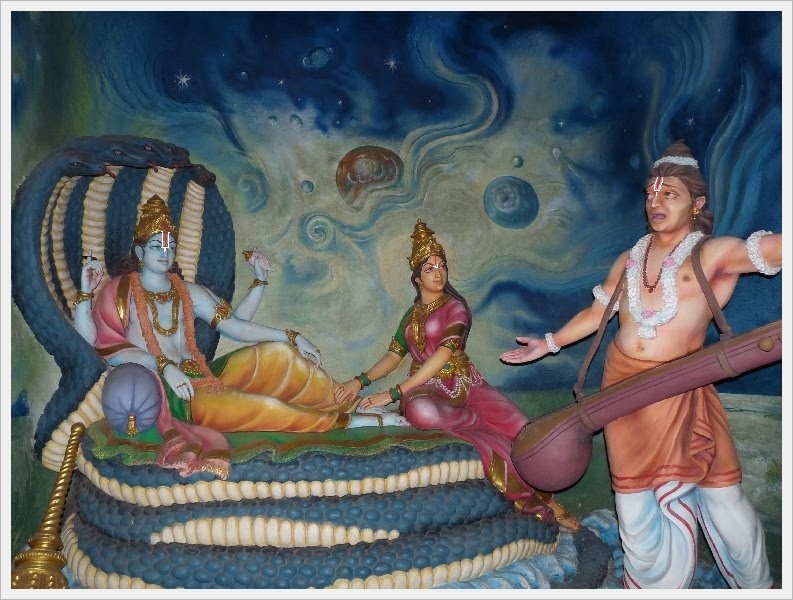 such – pugazh malindha pa -> pa : poetry/prabandham – is thiruvAimozhi etc., of nammAzhwAr. (pA) mannu mARan -> as AzhwAr was immersed in emperumAn’s nature and qualities, that experience could not be controlled inside, and came out for us due to the force of his bhakthi, and since it came out from emperumAn himself through nammAzhwAr, and as AzhwAr mentions ‘kavi amudham’ [thiruvAimozhi 8-10-5] and ‘thoNdarkku amudhu uNNa chol mAlaigaL chonnEn’ [thiruvAimozhi 9-4-9], he was fully enjoying the prabandham himself. mARan – makes emperumAn lose his mind in ecstasy as in ‘minnidai madavAr’ [thiruvAimozhi 6-2] as AzhwAr takes the form of parAnkusa nAyaki (female state of mind); and in ‘UNil vAzh uyir’ [thiruvAimozhi 2-3-1] emperumAn mixes with Azhwar into one due to His love; AzhwAr having such greatness. (mAran) adi paNindhu uyndhavan (irAmAnusan) – in such AzhwAr’s divine feet, rAmAnujar has surrendered and achieved the goal (of mOksham / winning of other philosophies and so forth). Thus this prabandham is shown as being in charama parva nishtai (final state of being – being subservient to devotees). 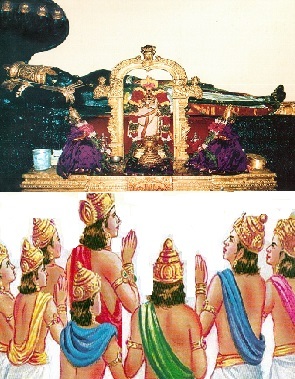 uyndhavan – for him (emperumAnAr), sustenance (ujjeevanam) is not dependent on food, liquids, etc; AzhwAr gave the divine feet for his survival instead; after getting AzhwAr’s divine feet, rAmAnujar was immersed in that experience only; even though they were separated by time, when AzhwAr gave all the details to nAthamunigaL, AzhwAr first meditated on the form of rAmAnujar, and emperumAnAr also thought about AzhwAr lovingly giving the bhavishyadhAcharyar vigraham to nAthamunigaL, and since AzhwAr is thus an Acharyan, emperumAnAr had held onto the divine feet of AzhwAr, and based his srI bHAshyam on the teaching of Azhwar saying ‘uNNum sORu, parugu(m) neer, thinnum veRRilai ellAm kaNNan emperumAn’ [thiruvAimozhi 6-7-1]; and emperumAnAr was living rectifying the processes in various divya dhEsams, and got his life’s use based on these from AzhwAr’s blessings – AzhwAr sat in one place and sang about dhivyadhEsams, but emperumAnAr fulfilled by physically going to these dhivyadhEsams and setting them up properly. palkalaiyOr – Those who are sakala sAsthra pArINar – well versed in all the sAsthrAs – nanmaiyAl mikka nAn maRaiyALargaL [kaNNinuN chiruthAmbu – 4] – like kUrEsar (kUraththAzhvAn), kurugEsar (piLLAn), gOvindhar (embAr), dhAsarathy (mudhaliyANdAn) had already surrendered to emperumAnAr, while other experts like yAdhava prakAsar, and yagya mUrthy (aruLALap perumAL emperumAnAr) were won over and reformed about vishitAdhvaitham and later they became ardent sishyAs of rAmAnujar. thAm manna – after understanding the correct meanings without any doubt, surrendered to rAmAnujar, never to leave his feet. 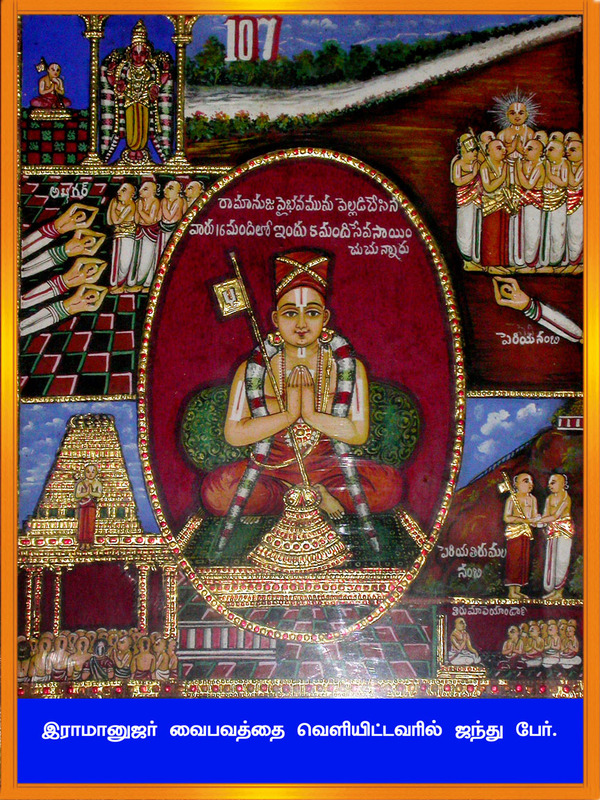 vandha – (emperumAnAr) came from paramapadham by requirement of sarvEshwaran. aravindham – manmadhan’s arrow contains lotus flower in its tip. 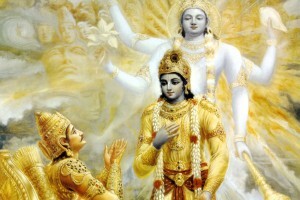 Here the lotus flowers are the divine feet of emperumAnAr. but says: pAdha bhaktham – for nammazhvar -> singular form. manni -> without hesitation or doubt we would like to be living under emperumAnAr’s divine feet always. Previous ‘manni’s would definitely happen – they would be set in their goals without fail; This manni might not happen due to our karmas etc., so he pleads to the mind. 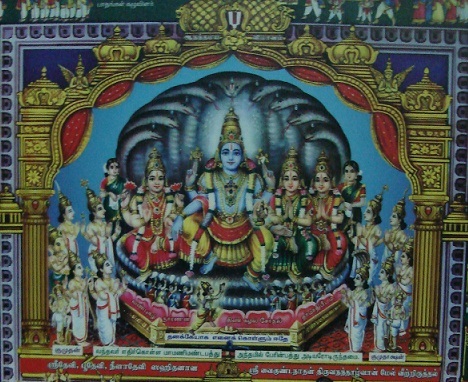 solluvOm avan nAmangaLE – let us recite/say rAmAnujar’s names. vAchA dharmam avApnuhi – it is a big dharma to speak about the greatness of him. In the case of bhagavan -> mAnasa kainkaryam is important (by mind). Here, just vAk kainkaryam would be enough (reciting). Similarly, nAvinAl naviRRu inbam eidhinEn [kaNNinuN chiruththAmbu – 2] – (said it with my tongue) – why mention tongue when ‘said’ is enough? => there, madhurakavi AzhwAr says that even without help of manas (mind) I just said his names. 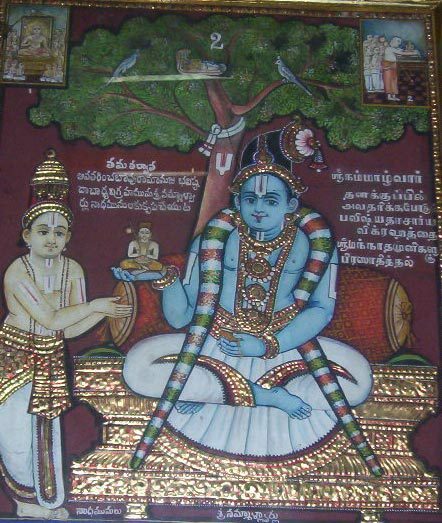 Just reciting his names would lead to the means and goal that is rAmAnujar’s divine feet. avan nAmangaLE => thEvu maRRaRiyEn [kaNNinuN chiruththAmbu – 2] -> we would say only ramAnujan’s name. Even if we are not able to engage the mind and body, at least saying the names would do. Next 5 names given by his AchAryas. 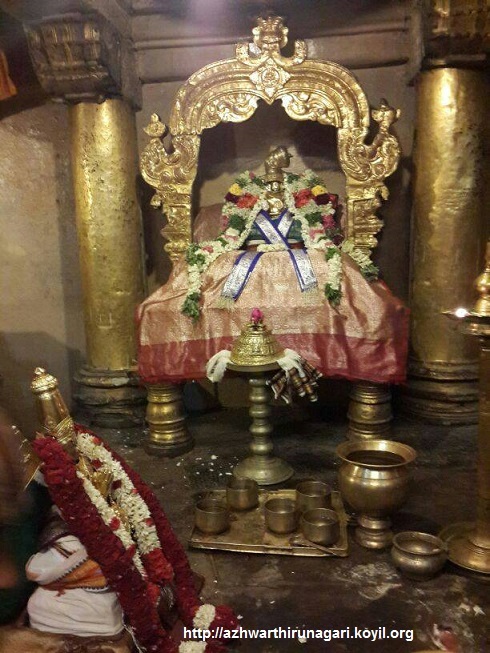 lakshmaNa muni -> thiruvarangap perumAL araiyar. 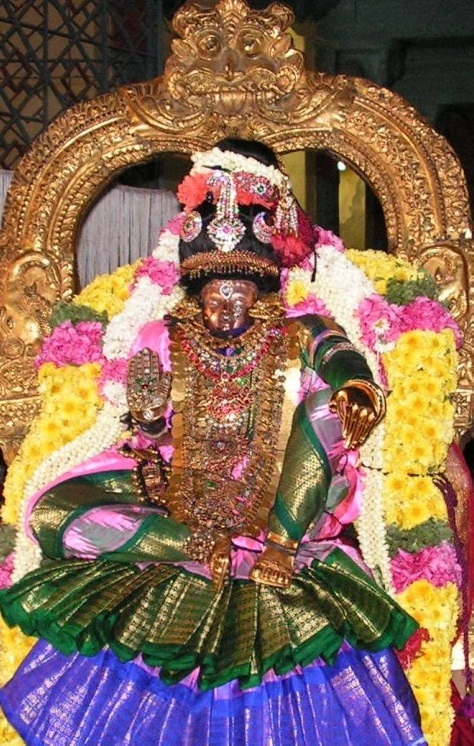 srI bhAshyakArar -> sAradhA dEvi. gurOr nAma sadhA japEth – always be reciting AchAryan’s divine names. chEthana samAdhi -> saying as if mind is like a chEthanam (sentient) -> mind is achith (non-sentient), but saying ‘solluvOm’ (let us recite, to his mind) -> due to its help for reciting rAmAnujar’s names. AzhvAn said ‘hantha’ -> ha! ha! can’t believe even creatures (janthu) like me are surrendering to his feet by saying the nAmam of rAmAnujar; with (unreasonable) wish of gaining any eligibility to change from a janthu. 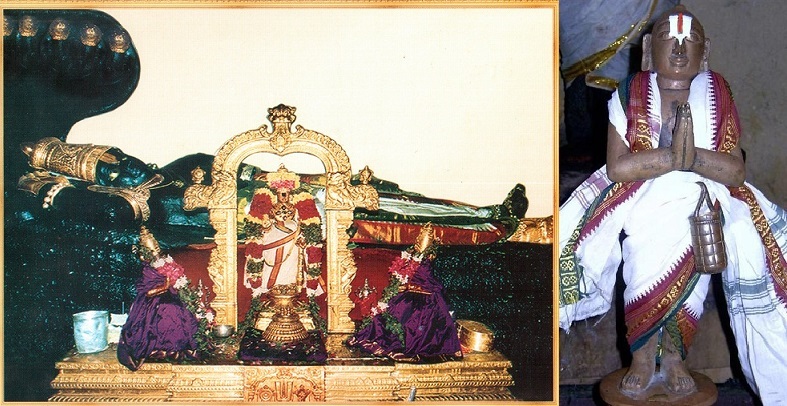 pAdha bhaktham rAmAnujam -> (mARan) adi panindhu uyndhavan. Arthi prabandham -> thamizh of yathirAja vimsathi line discussed above, ‘pU magaL kOn .. nenjamE vAzh’ – jeeyar also said to his mind. (this matches the first pAsuram of rAmAnusa nURRanthAdhi as well). This entry was posted in iyaRpA, rAmAnusa nURRanthAdhi and tagged 4000, azhvar, azhwar, dhivya, divya, english, introduction, iramanusa, jeeyar, jIyar, madhu, mannu, meanings, naalayira, naalayiram, namangale, nurrandhadhi, nurranthadhi, nutrandadi, nutrandhadhi, nutranthadhi, prabandham, pu, pumannu, ramanuja, ramanujar, ramanusa, thiruvarangathu amudhanar, vyakyanam on July 31, 2015 by raghuram. మధురకవి ఆళ్వార్ భగవంతుడి చేష్ఠితాలను అనుభవించింది నమ్మాళ్వార్లకు భగవంతుడు ప్రీతికరమైన వాడు కావున. మధురకవి ఆళ్వార్ నమ్మాళ్వార్లకు శరణాగతుడు. అందువలన ఆయన కిష్ఠమైన భగవంతుడిని తను కూడా సేవించాడు. ఎంపెరుమాన్ జీవప్రకృతికి వ్యతిరేకమైన శూర్ఫణకను ఒంటరిగా వస్తే పట్టుకున్నాడు. అదే ఎంపెరుమాన్ ఆణ్డాళ్ వంటి ఆచార్య నిష్ట కల వారికి తాను సులభుడు. ఇదే విషయాన్ని ఆండాల్ నాచ్చియార్ తిరుమొళి 13.10 లో “తంగళ్ తేవరై వల్ల పరిసు వరువిప్పరేల్” (పెరియాళ్వార్ల దేవుడు వస్తే ఆయనను నేను ఆశ్రయిస్తాను.) అన్నది. త్రిపురా దేవి ఎంపెరుమానార్ కాని, రుధ్రుడిని దేవుళ్ళలో ఉన్నతునిగా గుర్తిస్తే ఆయననే సంపూర్ణముగా ఆశ్రయిస్తాను అన్నది. అమేకున్న ఆచార్య నిష్ట అలాంటిది. నంపిళ్ళై వ్యాఖ్యానానికి అదనముగా పెరియవాచ్చాన్ పిళ్ళై ఈ సంఘటనను ఎత్తి చూపుతున్నారు. ఎంపెరుమానార్ తిరునారాయణ పురములో ఉండగా ఒక సారి కూరత్తాళ్వాన్, శ్రీరంగములో కోవెలకు వెళ్ళారు. ఆ రోజులలో ఎంపెరుమానార్ సంబంధీకులెవరిని కోవెలలోనికి రానీయరాదని రాజు ఆఙ. అందువలన ఆయనను లోనికి వెళ్ళకుండా ఆపేసారు. భటులలో ఒకడు “కూరత్తాళ్వాన్ ఆత్మగుణ సంపన్నుడని ఆయనను లోనికి వెళ్ళనివ్వ వచ్చ”ని చెప్పాడు. కాని కూరత్తాళ్వాన్ “రామానుజ సంబంధమును వదిలి ఆత్మ గుణములను చూసేట్టైతే అవి నిరుపయోగములు.” అని చెప్పి వెనకకు మరలి పోయారు. ఇది ఆచార్య నిష్టకు పరాకాష్ట. మధురకవి ఆళ్వార్ ఇంతకు ముందు పాసురములో “దేవు మఱ్ఱఱియేన్” అన్నటము వలన, తన దేవుడెవరో చెప్పుకున్నారు. భగవంతుడు మధురకవి ఆళ్వార్లకు తన అప్రాకృత స్వరూపమును చూపించారు. మధురకవి ఆళ్వార్లకు, నమ్మాళ్వార్ల పట్ల వున్న ఆచార్య నిష్ట దానికి కారణము. ఈవిషయమును మధురకవి ఆళ్వార్లు గుర్తెరిగి నమ్మాళ్వార్లను శరణాగతి చేయటము తప్ప తన ఙ్ఞానమో అనుష్టానమో దానికి కారణము కాదని చెప్పుకున్నారు. భావము: ఒక వేళ దాసుడు ఆచార్య నిష్ట నుండి జారినా, నీలమేఘశ్యాముడు, నిత్యసూరుల నాయకుడు అయిన శ్రీమన్నారాయణని ఆళ్వార్తిరునగరిలో అవతరించిన నమ్మాళ్వార్ల అనుగ్రహము వలన చూడగలుగుతాడు. భగవత్ విషయములో, చాందోగ్య ఉపనిషద్ లో “న చ పునర్ ఆవర్తతే” (ఒక సారి పరమపదము చేరిన వారు మరల తిరిగిరారు.) మోక్ష సాధనలో ఇది మొదటి మెట్టు. భాగవతుల పట్ల, ఆచార్యుల పట్ల చేసే సంపూర్ణ శరణాగతి ఆఖరి మెట్టు. ఆఖరి మెట్టు నుండి జారిన వాడు (ఆచార్య కైంకర్యము నుండి జారిన వాడు) మొదటి మెట్టు (భాగవత్కైంకర్యము)మీద పడతాడు. పెరియ వణ్ కురుకూర్ –భగవంతుడి అనుగ్రహము సంపూర్ణముగా గల నమ్మాళ్వార్లను అనుగ్రహించిన, సుఙ్ఞానులతో నిండిన ఆళ్వార్తిరునగరి ఎంతో గొప్ప ఊరు. ఈ విషయము స్వయముగా నమ్మాళ్వార్లు తిరువాయిమొళి 8.1.11 “పెరియ వణ్కురుకూర్ వణ్ శటకోపన్“ అని చెప్పుకున్నారు. ఆచార్య నిష్ట నుండి జారగానే, భగవంతుడి గురించి పాడటము మొదలు పెట్టారు. యోగ భ్రష్టులైన వారు ఊర్వశి అందమును గురించి పాడటము మొదలు పెట్టినట్లు, మధురకవి ఆళ్వార్ భగవత్ గుణములను గురించి పాడారు. ఇక్కడ కూరత్తాళ్వాన్కు శ్రీరంగములో జరిగిన విషయమును గుర్తు చేయటము జరిగింది. మధురకవి ఆళ్వార్ “అడియేన్” అన్నారు. అది నమ్మళ్వార్ల పట్ల వీరికున్న వినయమును తెలియ జేస్తుంది. భగవంతుడి విషయములో నమ్మళ్వార్లకు, మధురకవి ఆళ్వార్లకు ఉన్న అభిమానము “నన్మైయే” (మంచి) అనే ప్రయోగము వలన తెలుస్తున్నది. “తిరితంతాగిలుం” (వదలి వేయుట) మార్గ నిర్దేశము చేస్తున్నది. తిరువాయిమొళి పాసురము (2వ పాసురం )లోను ఇదే విషయము చెప్పబడింది. అంతిమముగా మధురకవి ఆళ్వార్ అన్నింటిని వదలి ఎంపెరుమాన్ శ్రీపాదములను చేరుకున్నారు. దేవపిరాన్ – ఒక వేళ మధురకవి ఆళ్వార్ ఆచార్య నిష్ట నుండి జారినా, నిత్యసూరుల నాయకుడు అయిన శ్రీమన్నారాయణుని శ్రీపాదములపై పడి నిత్యసూరి అవుతారు. నమ్మళ్వార్ చీకటి కాలమైన కలియుగములో అవతరించారు. శ్రీమన్నారాయణుని దయను ఇక్కడ చూడలేము. నమ్మాళ్వార్లు అవతరించిన ఆళ్వార్తిరునగరిని “కురుకూర్ నగర్” అని ప్రత్యేకముగా పేర్కొనటము వలన ఆ వూరిని శ్రీవైకుంఠముగా భావించారని తెలుస్తున్నది. పరమపధం మీద నమ్మళ్వార్లకు ఎటువంటి అభిప్రాయము వుందో “అయర్వఱుం అమరర్గళ్ అధిపతి” (తిరువాయిమొళి 1.1.1 ) అనే పాసురము ద్వారా తెలుస్తున్నది. “తిరునగరి” అన్నప్పుడు అదే అభిప్రాయము మధురకవి ఆళ్వార్లకు వుంది. ఆళురియనాయ్ – నమ్మళ్వార్లకు పరతంత్రుడు. వారి ఇష్టయిష్టాలు వీరికి ఇష్టయిష్టాలు అవుతాయి. తిరితంతాగిలుం –అన్న ప్రయోగానికి నాయనార్ కొత్త అర్థమును చెప్పారు. భగవంతుడి గురించి కాకుండా నమ్మళ్వార్ల పాసురములను పాడుతూ తిరుగుతుండగా భగవంతుడు తన కృపా దృష్టిని మధురకవి ఆళ్వార్ల మీద కురిపించారు. జితంతే స్తోత్రము 1.5 లో చెప్పినట్లుగా “భక్తానాం త్వం ప్రకాశసే” ( నీ భక్తులకు నీ స్వరూపమును విశద పరచు) నమ్మళ్వార్లకు భగవంతుడి మీద వున్న ప్రేమ, మధురకవి ఆళ్వార్లకు నమ్మళ్వార్ల మీద వుంది. అందు వలన భగవంతుడు మధురకవి ఆళ్వార్లకు తన స్వరూపమును విశద పరచారు. కరియ – నీల నిత్యసూరులు అనుభవించిన రూపము నీలి మేఘ వర్ణము కాదు. నమ్మళ్వార్లు అనుభవించిన రూపము కూద నీలి మేఘ వర్ణ రూపము కాదు. బంగారు వర్ణము 2.5.1 “ఎన్నావి సేర్ అమ్మానుక్కు సెంపొన్ తిరువుడంబు” (నేనుసేవించు స్వామి బంగారు వర్ణుడు.) మధురకవి ఆళ్వార్లకు మాత్రమే నీలి మేఘ రూపమును చూపి తన ఔధార్యమును ప్రకటించారు. తిరువురు – నాయనార్ ఈ ప్రయోగానికి శ్రీ మహాలక్ష్మి అని అర్థము చెప్పారు. వకుళ మాల పరిమళమునకు బదులుగా తుళసి పరిమళము వ్యాపించినది. నమ్మళ్వార్లు అనుభవించిన రూపమునకు భిన్నముగా దాసుడికి అనుగ్రహించాడు. మనసులో కొంచెము భీతితో స్వామి రూపాన్ని చూడగలిగాను. నమ్మళ్వార్ పరమపదనాధుడి మీద అపారమైన భక్తి గలవారు. నమ్మళ్వార్లకు దాసుడవటము వలన పరమపదనాధుడే అనుగ్రహించాడు. నాన్ముగన్ తిరువంతాది 15 లో “ఏత్తియిరుప్పారై వెల్లుమే మఱ్ఱవరైచ్ చాత్తియిరుప్పార్ తవం” (భగవంతుడి దాసులకన్నా భాగవత దాసులది ఉన్నత స్థానము.) మధురకవి ఆళ్వార్లు ఈ విషయమును బాగా తెలిసిన వారు. This entry was posted in kaNNinuN chiRuth thAmbu, mudhalAyiram, telugu on July 31, 2015 by chudamani chakravarthy. In the 9th pAsuram – AzhwAr requests the cool wind – After informing emperumAn “Can you let your subservient person die down like this?”, if he still ignores me, you should surely finish me. Subsequently, parAnkusa nAyaki looks at the cool wind which returns from emperumAn and tells it “After informing him about me, you have returned to kill me”. 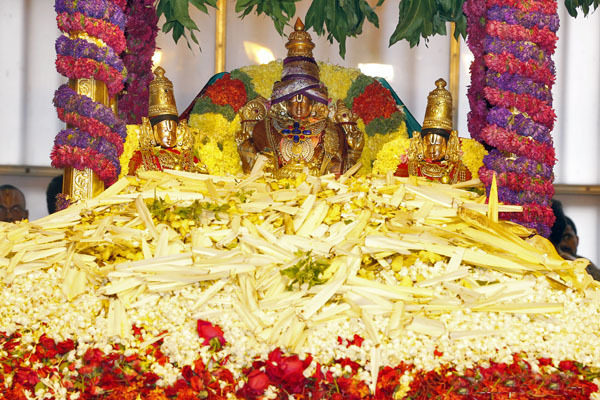 9th pAsuram – When parAnkusa nAyaki was thinking as in (the previous pAsuram) “sAyalodu maNi mAmai thaLarnthEn nAn” (I have become tired losing my color, luster, etc), a cool wind touches her body. Seeing its nature, she thought that there is something to it, just like thArai said “sugrIva was struggling a little while ago being beaten up by vAli – but the same sugrIva has returned with a great roar – there must be something to it (i.e., having the support of srI rAma))”. 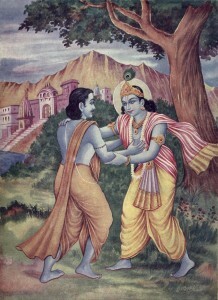 When a king would send his servants to torture those who disobey (or defame) the king, those persons may try to give some wealth, etc., to the servants to avoid the torture, parAnkusa nAyaki tells the cool wind “you go and inform him about my plight and if he does not care about my offerings, then you can return to finish me”. pani vAdAy – Oh cool wind! en seyvathO – what is the result of it? Oh cool wind which is travelling in between him and me! while I should be offering rare flowers unto his lotus feet daily and engaging my senses in the same, my unfortunate situation is that I am living alone in separation from him. After informing this to him and if you do not get positive feedback, please finish my body. vIdu here means separation. From this, we can understand that if the AchArya is harmful to us due to some reason, he is still worshippable by us since he is the one who will deliver us. nAdAtha malar nAdi – Some say this (flower) relates to “Athma pushpam” (the flower of AthmA which has certain auspicious qualities). Instead of that, nanjIyar explains this as highlighted in thiruvAimozhi 4.7.8 “eNdisaiyum uLLa pUk koNdu” (bringing flowers from eight directions) – bringing flowers that are rare to find. nALthORum – Without any break. For the AthmA whose true nature (of servitude) is established by kinchithkAram (little service), break in such service is an obstacle. 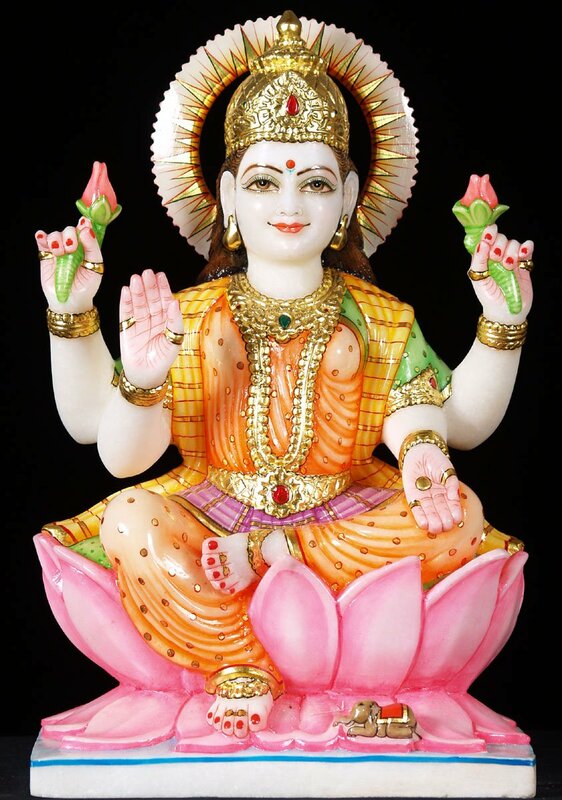 vAdAtha malar adik kIzh – unto the lotus feet which looks like fresh flowers. Even while being separated (in suffering), the lotus feet are so relishable and thus cannot be given up. vagukkinRu – present for that only. As explained in srI rAmAyaNam ayOdhyA kANdam 40.5 “srushtasthvam vanavAsAya” (sumithrai says to lakshmaNa – “you are created to accompany (and serve) srI rAma in the forest”. Similarly, the purpose of jIvAthmA‘s existence is to serve the most appropriate/deserving, easily approachable and ever relishable lotus feet of emperumAn. Instead of accepting my service, he is enjoying in separation from me. What can I do seeing this act of him? Being separated from him and also being given up by my relatives (and thus separated from them too), what can I do? UdAdu pani vAdAy – Just like a servant/messenger will travel transport messages between two parties, the cool wind is travelling back and forth between me and emperumAn. Also explained as: Udu – inside, Adugai – travelling. Reaching upto the inner quarters of emperumAn or you who were near us during the times we were together. uraiththu – When you tell him “this parAnkusa nAyaki (jIvAthmA) is born only to serve you eternally”, if he is like “I don’t even want the kainkaryam from her”, you return back and finish my body which cannot bear the separation from him. This entry was posted in thiruvAimozhi, thiruvAimozhi 1st centum on July 31, 2015 by Sarathy Thothathri. This entry was posted in gyAna sAram, hindi, Other on July 26, 2015 by narasimhantsl. ताने गुरुवागित: श्रीमन्नारायण के पास अपनी पहचान को गुप्त रखने के लिये और आचार्य रूप में आने के लिये एक कारण हैं । ज्यो की आगे पाशुर में समझाया गया हैं। तन अरूलाल: इसका कारण और कुछ नहीं उनकी अपार दया हैं जो उनके निर्हेतुक निमित्त से आती है। इसीलिये उनके आचार्य रूप लेने के कारण के लिये कोई तहक़ीक़ात करने की आवश्यकता नहीं है। वह किस पर अपनी दया बरसाते हैं?